In the far north of the Great Plains, you have to be a pharmacist to own a pharmacy. Next week, voters could overturn that rule—putting the state's thriving independent drugstores at risk. A pharmacy in the small town of Beulah, North Dakota. Photo by Andrew Filer. Downtown Carrington, North Dakota, has streets lined with businesses like Carrington Hardware and Barb's Rose Garden Floral & Greenhouse, and a water tower painted as an American flag. The town, located smack in the middle of the state, is home to 2,000 people, and every October through December, around 200 of them head to Main Street to meet with their local pharmacist. Shane Wendel, owner of Central Pharmacy, and his team review senior citizens' prescription drug plans under Medicare. Seniors can renew their prescription plans yearly, and, Wendel says, the covered medications can change yearly, too. From one year to the next, customers may or may not be able to get the same medications at the same price. The one-on-one appointments can take up to two hours, as the team reviews every drug the patient was prescribed in the last year. The team then explores coverage options for the coming year. This process potentially saves each senior hundreds of dollars in prescription costs for the year. In North Dakota, unlike any other state, independent pharmacies like Central Pharmacy are the norm—thanks to a 1963 law stipulating that only a licensed pharmacist or group of pharmacists can own and operate a pharmacy. But on November 4, North Dakotans will vote on a referendum that, if passed, would overturn that law—opening the door for in-house pharmacies at chains like Walgreens and Walmart. Those who oppose the referendum fear the loss of unique protections for local, independent pharmacies, which are becoming scarcer throughout the country and are more likely to serve rural populations. Some opponents believe that instead of being stamped out, North Dakota’s law should continue, serving as a model for protecting local economies by supporting independent businesses. On the other side, North Dakotans for Lower Pharmacy Prices, an entity funded almost entirely by Walmart to the tune of more than $7 million, hired a Michigan petition firm to gather the signatures required to put a referendum on the ballot. The campaign argues that overturning the existing law will open up competition for prescription drug sales in the state, thereby lowering drug costs for all North Dakotans. And although the campaign claims on its website that overturning the law will allow “consumers—not the Government—[to] decide where they buy their prescription drugs,” not everyone agrees that is the case. Most of us know how getting a prescription works: You go to the doctor, she diagnoses you and writes a prescription, and you take it to a nearby pharmacy covered by your insurance network to get it filled. Less understood, perhaps, is how insurance companies select which pharmacies they'll work with—meaning, which pharmacies you can go to—through intermediary companies called Pharmacy Benefit Managers, or PBMs. Those companies, which negotiate contracts between insurance providers and pharmacies, make up a $250 billion industry. As of 2013, the three largest PBMs—Express Scripts, CVS Caremark (yes, PBMs can also own their own pharmacies), and OptumRX—controlled 70 percent of the coverage for all U.S. prescriptions. When negotiating contracts with pharmacies, PBMs set reimbursement levels—the amount the PBM will pay back to pharmacies for each medication when a customer fills a prescription there—on a yearly basis. However, the fixed reimbursement levels don't always reflect real-life fluctuations in drug prices, which means the pharmacies lose money. Across the country, from Iowa (top left) to Michigan (bottom left), local pharmacies struggle to compete for contracts with large chains. Photos by Pete Zarria, Steve Snodgrass, and Memories by Mike. It’s not just pharmacists who feel the effects, either, because the system also determines where customers can go for their medications. Lyle Lutman, owner of Langdon Community Pharmacy in Langdon, North Dakota, negotiates a contract every year with CVS Caremark, a pharmacy benefit manager that operates CVS pharmacies (the only chain pharmacy operating in the state after it bought out independent Osco Drugs in 2006). While renegotiating his contract with Caremark this year, Lutman was informed by the company that it would no longer cover one particular insurance plan at his store. Since he could not negotiate an alternative without giving up the entire contract, Lutman accepted—and lost the customers under that plan. The Langdon families who are covered by that plan had three choices: They could continue to go to Langdon Pharmacy, paying full price for all of their prescriptions; they could fill their prescriptions by enrolling in Caremark’s mail-order program; or, they could drive more than 100 miles to the nearest CVS store, in Grand Forks. Lutman said that while this is just one example of how PBMs can steer customers away from independent pharmacies, he fears next week’s referendum, if passed, will spark major disruptions for the industry—especially for small business owners like him. In the rest of the country, independent pharmacies are losing more market share to larger chains. 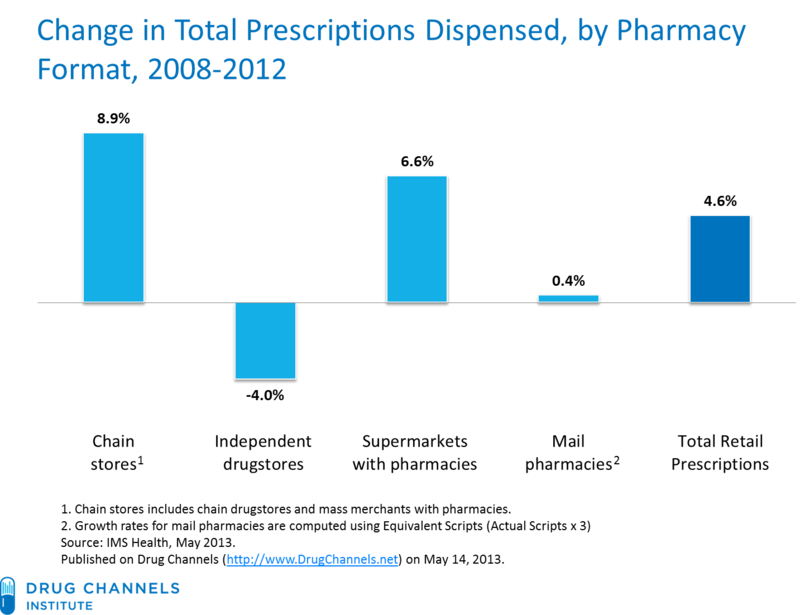 Between 2008 and 2012, the percentage of prescriptions dispensed by independent drugstores fell by 4 percent, while the share filled by chain stores grew by 8.9 percent. North Dakota's decades-old law has made it easier for local businesses to survive here. There are far more pharmacies per capita in the state (2.45 per 10,000 people) than the national average (1.88). Furthermore, independent pharmacies are more likely to reach underserved populations, like those in rural areas or with low incomes. According to the Institute for Local Self-Reliance (ILSR), of the 70 independent pharmacies in North Dakota, 25 of them serve sparsely populated areas, like Langdon and Carrington. An ILSR study of the pharmacy ownership law found that people in rural areas of North Dakota have better access to pharmacies, with more than 53 percent being served by a pharmacy than rural areas in South Dakota, where just 35 percent are served. Just as locally owned groceries, hardware stores, restaurants, and banks strengthen local economies when they thrive, studies have found that independent pharmacies do more to boost community wealth than chains do. A 2008 study by Civic Economics found that for every $100 spent at independent pharmacies, like Langdon Community Pharmacy, $17.20 went to local wages, profits, and goods and services purchased in the local area—compared to $9.70 for every $100 spent at chain pharmacies. In fact, the ILSR reports that independent pharmacies in North Dakota generate more than $76 million in local economic impact, including money spent on other in-state businesses—an impact that could decrease by up $28 million if the referendum passes. Back in Carrington, Wendel describes the services he offers for his customers in addition to counseling on Medicare options. He and the other pharmacists at his store participate in medication adherence programs, which involves working with a team of nurses, physicians, and patients to ensure that patients are following the proper medication regimen for diabetes. His team also helps customers keep better track of their medications by combining all the pills they take daily in individual containers, instead of giving them several bottles to sort out themselves. Mary Hansen wrote this article for YES! Magazine, a national, nonprofit media organization that fuses powerful ideas and practical actions. Mary has a hard time staying in one place, but is known to write, edit, and be a die-hard Steelers fan. She is an online reporting intern for YES!